HVS-1000B Digital Display Microhardness Tester can be used to determine the Vickers hardness of steel, non-ferrous metals, ceramics, treated layers of metal surface, and the hardness grads of carburized, nitrided and hardened layers of metals. It is also suitable to determine the Vickers hardness of micro and super thin parts. It can be used to determine the Vickers hardness of steel, non-ferrous metals, ceramics, treated layers of metal surface, and the hardness grads of carburized, nitrided and hardened layers of metals. 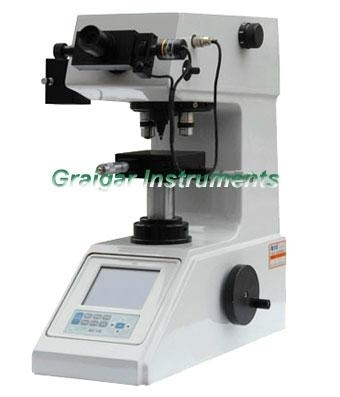 It is also suitable to determine the Vickers hardness of micro and super thin parts. Thin shaft anvil (Ø0.3- Ø5mm): 1 pc. Thin plate anvil: 1 pc. Flat nose pliers: 1 pc. Small V-notch anvil: 1 pc. Diamond pyramid penetrator: 1 pc. Micro-Vickers standardized block: 2 pcs.